Check out the San Diego tide chart with these easy-to-read graphical tide charts for San Diego, California. Tide chart made simple! No more complicated San Diego tide chart tables to try to interpret! If you enjoy walking along the beach, tidepooling, or surfing, it is important to know the best time to go, which often depends on the tides. If you want to hike to a secluded beach, make sure the tides are low enough to get there and back. Tides vary a lot depending on the day and the moon, and can be predicted, however weather conditions such as a storm can change conditions. 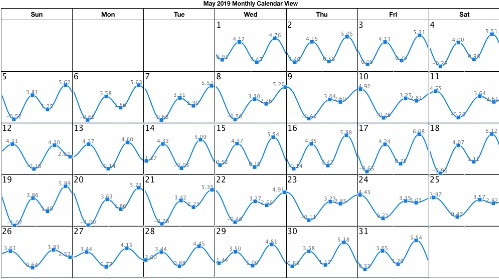 So check out these tide chart, or if you prefer to look at the numbers on the tide tables, see San Diego tide tables or low tides at best dates and times to see San Diego tide pools. Tide data based on predictions for La Jolla beach made by NOAA for 2019. We report tide height in feet. I love this online San Diego tide table showing low and high tide. 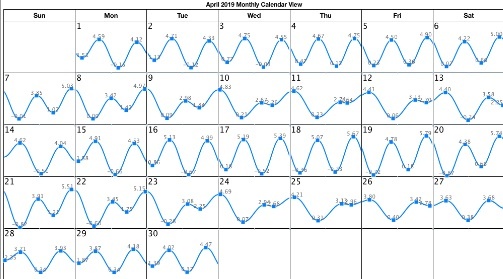 This graphed tide chart shows the forecast of San Diego tides, to help you better plan your time at the San Diego beach. The vertical axis ranges from minus 2 to 8 feet, and the horizontal axis shows 24 hour days, with grids at 6 AM, noon, 6 PM and midnight. You can see when now is, and easily read the low tide and high tide in feet. These show the La Jolla, California tide predictions, which are a good representation for San Diego coastal tides, from San Diego to North County (including San Diego, Coronado, Imperial Beach, Point Loma, La Jolla, Solana Beach, Encinitas, Carlsbad, and Oceanside). You can easily see the predicted San Diego high and low tides on the graph. All of the La Jolla San Diego Tide Charts shown on this page are from the official NOAA tide charts. Caution: Actual tides may vary from predicted tides due to current weather conditions, such as when a Surf Advisory is in effect. Please be safe. These tidal forecasts are provided for your convenience and may not be accurate or reliable. 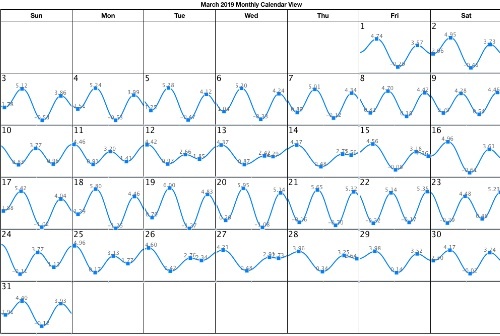 See the Graphical Tide Charts by month below. 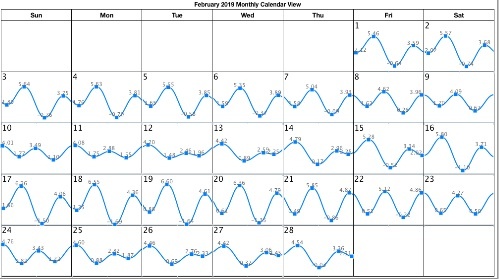 The following show the monthly tide charts, from NOAA website. The vertical axis ranges from minus 2 to 8 feet, and the horizontal axis shows 24 hour days, with grids at 6 AM, noon, and 6 PM. 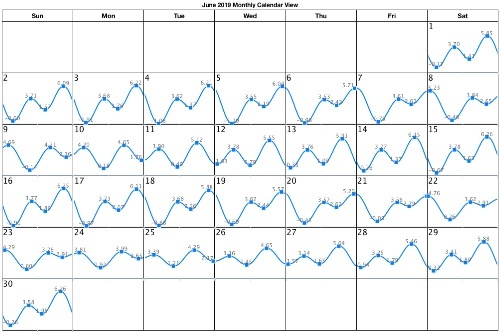 Note: July 2019 San Diego Tide chart will be posted later in the year. Note: August 2019 San Diego Tide chart will be posted later in the year. Note: September 2019 San Diego Tide chart will be posted later in the year. Note: October 2019 San Diego Tide chart will be posted later in the year. Note: November 2019 San Diego Tide chart will be posted later in the year. 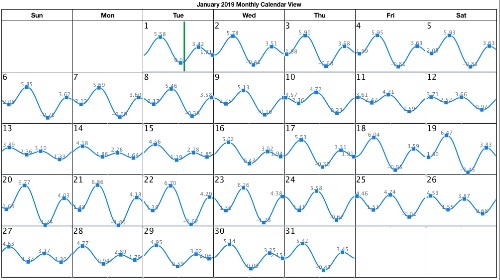 Note: December 2019 San Diego Tide chart will be posted later in the year.